A circular walk from Bowderdale in the Howgills. An easy to follow path follows a beck through Bowderdale before climbing more steeply up to the Calf in the Howgills. 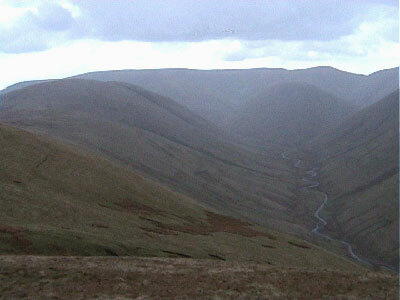 The Calf offers wonderful panoramas of the Howgills and Lakeland Fells. The return is via a lofty, wide ridge path that offers views all the way! Parking: Follow the Bowderdale sign about 4 miles east of junction 38 of M6 motorway on the A685 Tebay to Kirkby Stephen road. Follow the road around to a T-junction. Turn left and follow the lane around taking the right-hand fork, again following the wooden sign for Bowderdale. Continue on the lane past a few houses, and there is limited roadside parking just over the bridge (grid reference NY 677 046). If full, part back near the A685 and walk back around to here. From the riverside parking, continue on up the lane away from the bridge, and turn left after about fifty yards following the bridleway sign for Bowderdale. Keep on this track running parallel with a wall and pass through two gates. The path up on to West Fell and the broad ridge running southwards from it can be seen directly ahead. Through the second gate, the track starts to wind and climb slowly to the gate in the far corner of the enclosed field. Pass through that gate and continue on slowly climbing on the now grassy path, which keeps a few yards to the right of a wall. As the wall starts to swing around to the left, follow the footpath around with the wall, ignoring the path which continues ahead up West Fell. The path immediately then leaves the wall and heads slightly downhill for Bowderdale Beck. After about half a mile the path pulls in almost alongside the beck. The path then continues on the right-hand side of the beck, climbing very slightly for about the next two miles passing a couple of solitary trees along the way. Along this stretch, various small tributaries run down into the beck causing the ground in places to be very wet underfoot. After crossing Hazel Gill, which flows into the Beck at 679996, the climb starts to become steeper. Then about a quarter of a mile further on, just before crossing Ram's Gill, the path starts to move away from the beck and head off diagonally up to the right, now climbing much steeper. The path here is a little indistinct in places, but as it starts its top plateau becomes much clearer. The path then continues its swing around to the right before passing a tarn. Keep on this path for a further few hundred yards to the triangulation point on the Calf (676m / 2220 feet). From here there are excellent panoramic views, going clockwise from the North the following can be seen: Great Dunn Fell; Mickle Fell; Wild Board Fell; Great Shunner Fell (almost due East); Baugh Fell; Pen-y-ghent; Whernside; Ingleborough; Middleton Fell (almost due South); Arnside Knott and the Kent Estuary; Coniston Old Man (almost due West); Crinkle Crags; Scafell; Scafell Pike; Great Gable; Pillar; Fairfield; Helvellyn; High Street and Blencathra. From the Calf return back the few hundred yards to the tarn along the gravelled path. As the path passes the tarn take the path which goes off to the left immediately past the tarn. The path then heads northwards along a broad ridge. The path descends quite quickly down the wide tractor track, before climbing slightly to pass around the left of Hazelgill Knott. The path then again drops quite steeply before climbing gradually for about three-quarters of a mile onto the start of West Fell. Every so often the path appears to split, but on each occasion either fork can be taken as a little further on they rejoin. All along this stretch there are excellent views into the Langdale Valley to the left and Langdale Fell on the far side of the beck. After a further mile and a half of descent off West Fell, the path pulls back in alongside the wall which was left at the start of the walk to drop across to Bowderdale Beck. Continue along the left-hand side of this wall, then continue along the track passing back through the three gates and back out onto the lane. Turn right and follow the lane the final few yards back down to the parking area.